What strategies do YOU use to protect your online identity? At a time when much attention has been focused on how much individuals can protect their privacy in a wired world, a new survey by the Pew Research Center’s Internet Project finds that 86% of internet users have taken steps online to remove or mask their digital footprints. More than half (55%) of internet users say they took the steps to avoid observation by specific people, organizations or the government. 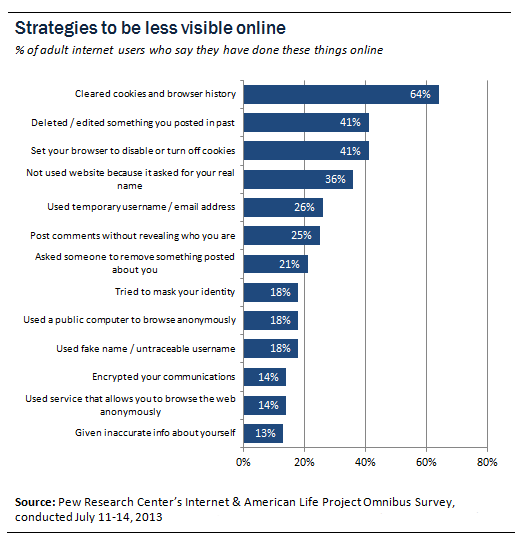 But despite such efforts, 59% of internet users don’t believe it’s possible to achieve complete anonymity on line. Read the full report. From deleting cookies from browsers to using temporary e-mail names, internet users have tried a variety of strategies to protect their privacy. What have you done? What steps do you think are most effective, and which have you found to be of little use? Tell us your experiences, using our comments section.